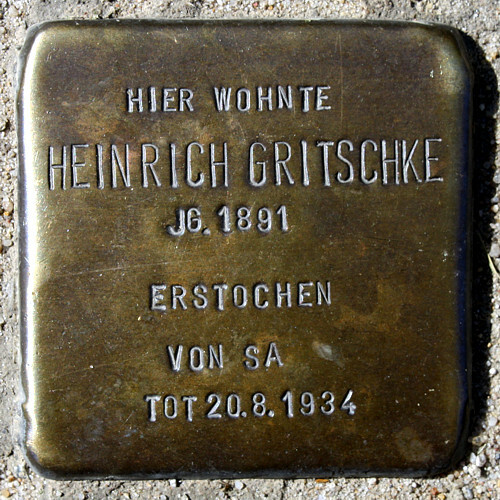 The non-party metal worker Heinrich Gritschke (1891 - 1934) on 19 August 1934 fell into a dispute with members of the paramilitary Nazi SA organisation in a Frankfurt inn. An alleged insult to the SA on Gritschke's part led to a fight, whereupon the SA lieutenant general Franz Sch. stabbed Heinrich Gritschke. He died in the early morning of 20 August in the inn's hall. The investigation against Franz Sch. was influenced by the National Socialist German Workersist NSDAP in such a way that he was charged only with bodily harm resulting in death.